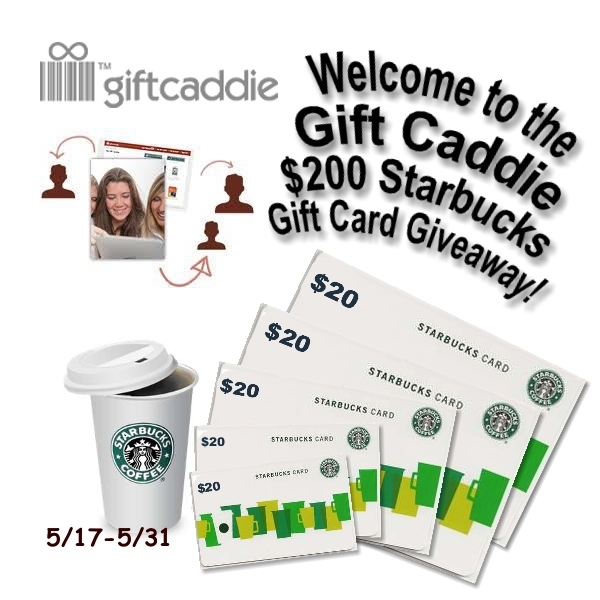 Welcome to the Gift Caddie $200 Starbucks Giveaway! This giveaway is being sponsored by www.giftcaddie.com and co-hosted by the following bloggers: Mama Nibbles, Turning the Clock Back, The Adventures of JMan and MillerBug, About A Mom, Susan's Disney Family and Slap Dash Mom to bring you the chance to win one of ten -$20 Starbucks gift cards. The way this giveaway works is, you refer somebody to register on Gift Caddie and have them enter here. If the person you refer wins then YOU win as well! So tell all your friends, family and everyone you can. You will find a space on the entry form to enter your referral name. Enter on the Rafflecopter form below for your chance to win. **This giveaway event will begin on May 17th at 12:01 am EST and end on May 31st 11:59 pm. Giveaway is open to US residing entrants, must be 18 or older, only 1 entrant per household will be permitted. Winners will be chosen via random.org and contacted via email. Winner will have 48 hours to confirm prize before a forfeit is assumed. Each blog is using the same Rafflecopter. You only need to enter the giveaway on one blog. Participating bloggers are not responsible for any prize fulfillment. Winner will be announced as soon as their entry is verified and he/she has been contacted. Only registered users can win, so be sure you register.